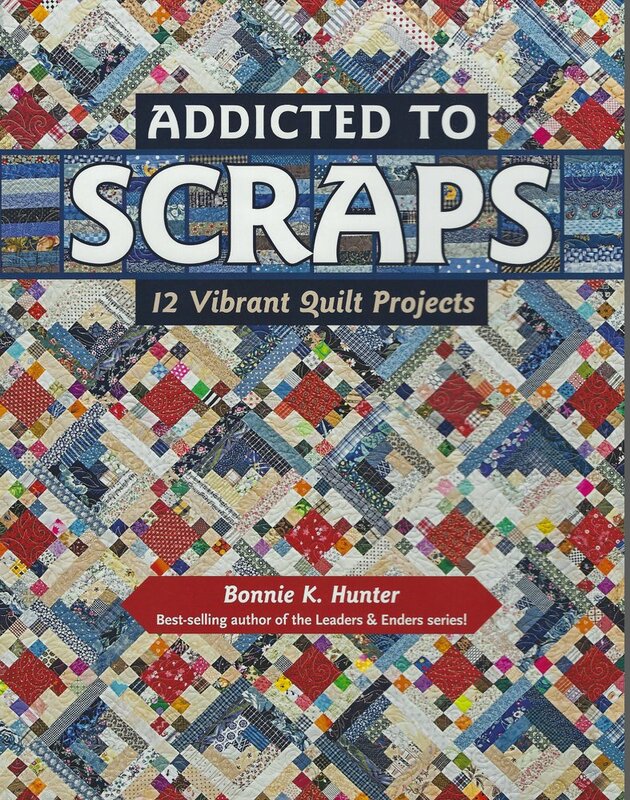 Addicted to Scraps by Bonnie K. Hunter. Don’t crumble under the weight of your scraps—embrace them with best-selling author, Quilt maker columnist, and esteemed teacher Bonnie K. Hunter. Piece 12 unique, multicolored scrap quilts in Bonnie’s signature style. Turn leftover strips into usable fabric that’s readily available for projects with the easy-to-use Scrap User’s System. This complete guide to scrap quilting includes full-size templates, 2 paper-piecing patterns, and a full chapter on quilt making basics. Forever change the way you look at scraps! 12 versatile quilt patterns for scrap addicts. Savor scraps of all shapes and sizes with best-sellingauthor and Quiltville teacher Bonnie K. Hunter. Make fabric strips usable again with Bonnie’s popularbest storage tips and practices.